Borgund’s catchment area, where the precipitation is collected in dams, is located in a mountainous valley between eastern and western Norway. The catchment area is 404 sq. kms, which is equivalent to more than 56 500 football fields, and consists of nine lakes. The water is gathered in reservoirs high up in the mountains and directed through tunnels to the station. Since the reservoir is designed to hold large quantities of water, the production can be altered based on electricity demand. While the reservoirs are located high up in the mountain, the power station itself is partly set inside the mountain towards the bottom of the valley. The façade of the power station is relatively indiscernible on the surface while the station itself, with its impressive machinery, lies 160 meters beneath the ground. To access the turbine room, one has to drive almost 2 kms through the tunnels down in the mountains. In order to meet increasing global demand for energy in a truly sustainable way, Østfold Energi believes that it is vital not only to build new renewable power plants but also to increase efficiency of existing renewable power plants. Opening of Eldrevatn powerplant was a milestone for both Østfold Energi and the local community in addressing the need for clean power and increasing employment in the local area. 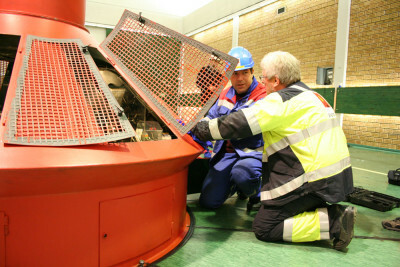 The small hydro plant has an output of 24 GWh per year, equivalent to the average electricity consumption of more than 1500 Norwegian households. More importantly, after the energy of the water is used to produce electricity at Eldrevatn power plant, water flows toward Borgund power plant where another fall of more than 800 meters enables us to produce renewable energy again. This ensures that the natural resources within our regulated areas are utilized optimally, and we get the most renewable energy with minimal infrastructure development. In recent years the Borgund power plant has also implemented several measures to increase efficiency of production. One of the contributing projects was full rehabilitation of the 1150 meter long tunnel that directs water under high pressure from the mountain reservoirs down to the power station. In 2011, the tunnel was sand-jetted and painted, a process that resulted in increased production by approximately 3 GWh per annum. Additionally, both turbines at the power station have been upgraded to improve efficiency, leading to a further increase in production. Producing energy through renewable sources is indisputably favourable from a climate perspective. Nevertheless hydro power production could have local impact on nature and biodiversity, especially on fish, freshwater ecosystems and wild reindeer living in the area. Østfold Energi has implemented a range of measures to ensure that the area retains its rich bio-diversity and to contribute in preserving the population of Norwegian salmon and trout. Four fish ladders were installed to considerably extend the parts of the river where the salmon passes through from 25 to 40 kilometres, increasing the climb with 44 meters. In addition, the salmon- and trout hatchery is 100% financed by Østfold Energi. The hatchery has annual capacity of one million alevin (salmon eggs) and the company contributes in the work to release the alevin into the river and mountain lakes. Østfold also contributes in adding several thousand trout in the mountain dams, situated between 1 100 and 1 400 meters above sea level. This measure also ensures maintenance of fish stocks in the long term. To protect freshwater ecosystems, the Borgund plant continuously monitors and logs the in-flow of water and is fitted with equipment that allows water to pass through if the river should be in threat of being drained. In 1996, the Lærdal River was infected by the salmon parasite Gyrodactylus Salaris. The authorities fought the contamination actively and Østfold Energi has contributed to this work through funding and adjusting power production according to need. 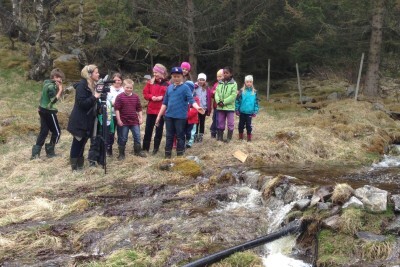 As Borgund power plant is a landmark in Lærdal community, the children and teenagers in the area are extremely interested in hydro power production. When the pupils from 5th and 6th grade at the local Borgund school expressed interest in producing their own electricity, mechanical engineer Heine Johannes Linga at Borgund took on the challenge. Together they built a micro power plant with theoretic effect of 850 Watt built entirely from a range of recycled parts from car parts to fire hoses. The pupils were fully engaged in building the micro power plant by helping build a pond, lay down pipes and assemble the power plant. Through this practical task they learnt a lot about hydro power, something they can apply to their science and physics lessons.